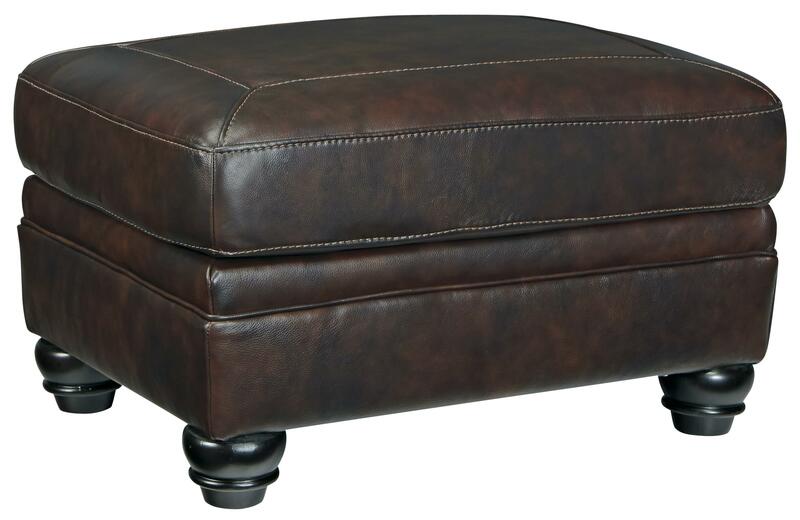 Leather match upholstery provides luxury to this traditional style ottoman. It is the perfect piece to add to the coordinating chair. The Bristan Traditional Leather Match Ottoman by Signature Design by Ashley at Michael's Furniture Warehouse in the San Fernando & Los Angeles area. Product availability may vary. Contact us for the most current availability on this product. With traditional style to impress and luxurious comfort, this leather match upholstery collection has all you need to refresh your living room in grand style. The brown walnut 100% leather covers seating areas with matching vinyl on the backs and sides. Meanwhile, seat cushions with superior coil seating provide support and durability to the seat cushions. 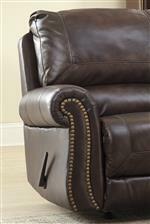 Classic details, such as nailhead trim, rolled arms, and jumbo accent stitching, complete the look of each piece. The Bristan collection is a great option if you are looking for furniture in the San Fernando & Los Angeles area. 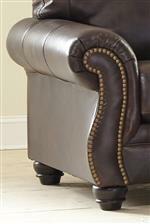 Shaped Rolled Arms with Nailhead Trim. Turned Feet in Dark Finish. Browse other items in the Bristan collection from Michael's Furniture Warehouse in the San Fernando & Los Angeles area.